DOVER, Del. 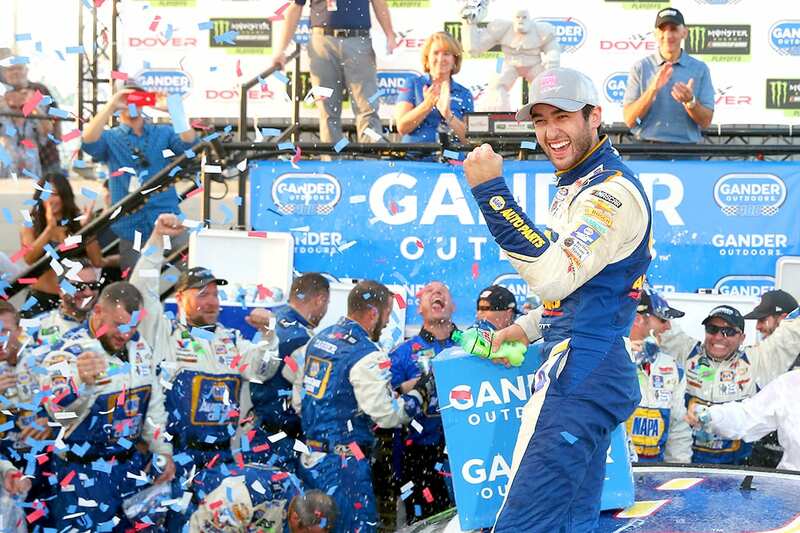 – What looked like a Stewart-Haas Racing victory parade for much of Sunday afternoon ended in a wild overtime scramble, with Chase Elliott taking the checkered flag in the Gander Outdoors 400 at Dover International Speedway. On considerably older tires, Elliott pulled ahead cleared runner-up Denny Hamlin through Turns 1 and 2 after a restart on Lap 403 and powered his No. 9 Hendrick Motorsports Chevrolet across the finish line .265 second ahead of Hamlin’s Toyota. 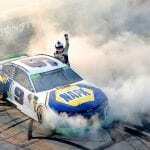 With the victory—his second of the season and the second of his career—Elliott punched his ticket into the Round of 8 in the Monster Energy NASCAR Cup Series Playoffs, extricating himself from the bottom four in the postseason standings. “This was a lot about perseverance,” said Elliott, who recovered from a penalty for an uncontrolled tire incurred during a yellow-flag pit stop on Lap 123. “We had a penalty early and fell behind and luckily had a good enough car and good strategy to get back (to the front). What a day! 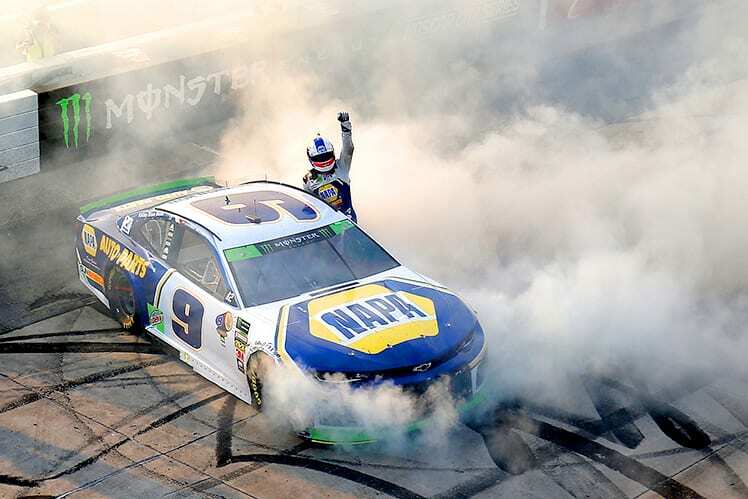 The win was a satisfying turnaround from the same race last year, when Elliott had victory in his sights, only to be tracked down and passed by Kyle Busch on the next-to-last lap. The move that won the race was crew chief Alan Gustafson’s decision to keep Elliott on the track with tires that were more than 50 laps old, when most of the other lead-lap cars opted to pit on Lap 393 after Clint Bowyer’s Ford slammed into the Turn 4 wall one lap earlier. Elliott led the field to a restart on Lap 397, but on the backstretch during that circuit, Aric Almirola nicked the outside wall and started a chain-reaction collision that also damaged the cars of fellow Playoff drivers Brad Keselowski, Alex Bowman, Martin Truex Jr. and Ryan Blaney. NASCAR red-flagged the race, and Elliott outran Hamlin in an overtime that extended the event four laps beyond its scheduled distance. The only laps Elliott led were the last 11. Kevin Harvick, on the other hand, was out front for 286 of the 404 laps in a No. 4 Ford that was the clear class of the field. Harvick swept the first two stages, as he had done during his June victory at the Monster Mile and appeared headed for another perfect afternoon, but the 2014 series champion had to return to pit road under green for an extra tire change after a flying lug nut knocked the valve stem off Harvick’s left rear tire. Harvick regained the lap he lost under a debris caution called on Lap 339, but he couldn’t work his way back to the front before the race ended. Joey Logano dodged the Almirola wreck and finished third, followed by Erik Jones, Kurt Busch and Harvick. Austin Dillon ran seventh, one spot ahead of Kyle Busch, who snared his top 10 despite dealing with a malfunctioning track bar adjuster throughout the afternoon. For a long stretch after a restart on Lap 248, the four Stewart-Haas drivers—Harvick, Almirola, Bowyer and Kurt Busch—ran 1-2-3-4. But Bowyer had to a pit with a flat tire on Lap 382, after racing side-by-side with Ryan Newman, Harvick had his issue on pit road, and Almirola lost his winning chances when Bowyer hit the wall late in the race. Harvick leaves Dover with a five-point lead over Kyle Busch. After the Oct. 21 race at Kansas, the Playoff field will be trimmed from 12 drivers to eight.DOVER, Del. – What looked like a Stewart-Haas Racing victory parade for much of Sunday afternoon ended in a wild overtime scramble, with Chase Elliott taking the checkered flag in the Gander Outdoors 400 at Dover International Speedway. Harvick leaves Dover with a five-point lead over Kyle Busch. After the Oct. 21 race at Kansas, the Playoff field will be trimmed from 12 drivers to eight. when Bowyer hit the wall late in the race. Harvick leaves Dover with a five-point lead over Kyle Busch. After the Oct. 21 race at Kansas, the Playoff field will be trimmed from 12 drivers to eight.